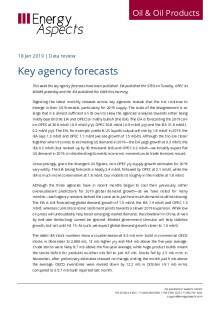 This week the key agency forecasts have been published. EIA published the STEO on Tuesday, OPEC its MOMR yesterday and the IEA published the OMR this morning. Digesting the latest monthly releases across key agencies reveals that the trio continue to diverge in their US forecasts, particularly for 2019 supply. The scale of the disagreement is so large that it is almost sufficient on its own to skew the agencies’ analyses towards either being mildly bearish (the EIA and OPEC) or mildly bullish (the IEA). The EIA is forecasting the 2019 call-on-OPEC at 30.6 mb/d (-0.9 mb/d y/y), OPEC 30.8 mb/d (-0.9 mb/d y/y) and the IEA 31.6 mb/d (-0.2 mb/d y/y). The EIA, for example, predicts US liquids output will rise by 1.8 mb/d in 2019, the IEA says 1.3 mb/d and OPEC 1.7 mb/d (we see growth of 1.5 mb/d). Although the trio are closer together when it comes to estimating US demand in 2019—the EIA pegs growth at 0.3 mb/d, the IEA 0.2 mb/d (but revised up by 30 thousand b/d) and OPEC 0.2 mb/d—we broadly expect flat US demand in 2019, on decelerating domestic economic momentum as trade tensions mount. Unsurprisingly, given the divergent US figures, non-OPEC y/y supply growth estimates for 2019 vary wildly. The EIA taking forecasts a heady 2.4 mb/d, followed by OPEC at 2.1 mb/d, while the IEA is much more conservative at 1.6 mb/d. Our models sit roughly in the middle at 1.8 mb/d. Although the three agencies have in recent months begun to cool their previously rather overexuberant predictions for 2019 global demand growth—as we have noted for many months—each agency remains behind the curve as to just how much demand could be slowing. The EIA is still forecasting global demand growth of 1.5 mb/d, the IEA 1.4 mb/d and OPEC 1.3 mb/d; whereas current economic sentiment points towards a slower 2019 expansion. While low oil prices will undoubtedly help boost emerging market demand, the slowdown in China, driven by end-user destocking, cannot be ignored. Modest government stimulus will help stabilise growth, but not until H2 19. As such, we expect global demand growth closer to 1.0 mb/d. The latest IEA stock numbers show a counter-seasonal 8.5 mb m/m build in commercial OECD stocks in December to 2,866 mb, 12 mb higher y/y and 46.4 mb above the five-year average. Crude stocks were likely 8.7 mb above the five-year average, while huge product builds meant the stocks deficit for products ex-other oils fell to just 6.5 mb. Stocks fell by 2.5 mb m/m in November, after preliminary estimates showed no change, ending the month just 9 mb above the average. OECD inventories were revised down by 12.2 mb in October (-9.1 mb m/m), compared to a 5.7 mb build reported last month.